After the initial dramatic success in Tunisia, then Egypt, the ‘Arab spring’ stalled. In Libya, a bloody uprising and protracted civil war, the Gaddafi dynasty was defeated with decisive NATO support, to result in a fragmented polity beset by diverse militias and continuing violence. Syria is being destroyed by a continuing civil war between an intransigent regime and a fragmented opposition, becoming a covert proxy conflict between regional powers and the imposition of the prevalent sectarian geopolitics. Yemen’s turbulence resulted in the removal of the dictator, but the continuation of the regime, including the sons and brothers of the dictator, presiding over a ‘failed state’ with many fractions and armed conflicts. The Bahrain Sunni monarchy succeeded in suppressing the predominantly Shi`i uprising and opposition, with the tacit complicity of the ‘international community’, beholden to the Saudi regime behind Bahrain’s ruler. In the monarchies of Jordan and Morocco, the echoes of the ‘spring’ led to liberal gestures by the regime, conceding some powers to elected bodies, but retaining firm control. These events pushed Iraq out of the main news, as nothing dramatic seemed to occur: the country, however, continues to be mired in inertia, corruption and violence. Plentiful oil revenues are shared out between ruling political fractions, with a major share going to the security state being built up by Prime Minister Maliki, the emerging dictator. The kingdoms and sheikhdoms of the Arabian Peninsula remain solid, with minor tremors, buying peace from their small populations and undisturbed by the imported working classes. The vociferous publics, mainly educated middle class, but poor men and women who started the upheavals - called for liberty, democracy, dignity and social justice, and an end to corruption and repressive police states. These were universalist demands, eschewing the ethno-religious and anti-imperialist slogans of earlier oppositions. Not that these publics were any more sympathetic to the US and Israel, but, on this occasion, the denunciation of their rulers came to the fore, not diverted or masked by external targets. However, in the countries where the movement succeeded in removing the dictators and installing electoral democracy, the main beneficiaries of the transformation have been the Islamic parties. These were also beneficiaries of token liberalisation in Morocco, Jordan and Kuwait. What are the causes and consequences of these outcomes? The dictatorships which ruled in Egypt, Iraq, Syria and Tunisia were the heirs to the nationalist revolutions of the mid-twentieth century. They appealed to the populace with anti-imperialist stances and socialist ideologies, implicitly secular. Gamal Abdul-Nasir (President of Egypt, 1956-70) was the most prominent such revolutionary, who gained the devotion and adulation of the masses, not just in Egypt, but throughout the region. Others, like the Iraqi Ba`th and Saddam Hussein (ruled 1968-2003), endowed with petrolic wealth, ruled by a mixture of repression and welfare. All these regimes entered an implicit social contract with their populations: acquiescence in return for state welfare and a measure of social justice, primarily land reform and the provision of state employment. This compact broke down in the later decades of the century. The nationalist military and developmental programmes stalled and were seriously undermined by failures, notably the defeat in the 1967 war with Israel, for Egypt and the Arabs, and later Saddam’s destructive military adventures against Iran (1980-88), then Kuwait (1990-91). 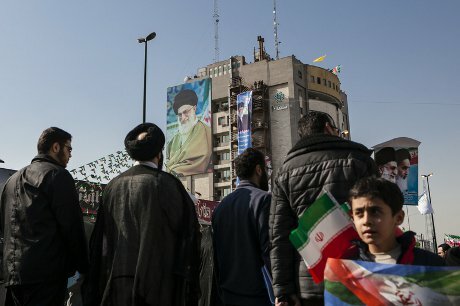 The 1979 Iranian revolution posed a threat and a challenge to its Arab neighbours, demonstrating the power of popular mobilisation and the appeal of Islam as a liberationist ideology. Demotix/Hanif Shoaei. Iran marks the 34th anniversary of the Islamic revolution. All rights reserved. The collapse of the Soviet and communist world after 1989 diminished the credibility of socialism and the left. In any case, by that time, the socialist and welfarist pretence of the regimes became ever more hollow, as they could no longer sustain the earlier social compact, and took their economies progressively into the neo-liberal capitalist sphere. Only it was the particular genre of ‘crony’ capitalism, in which dynasties and families of the dictators became the main dispensers of favours, contracts, licenses and credits, into which they took them. The nationalist ideologies became ever more hollow and the ruling parties became merely vehicles of allegiance and patronage. The vast majority of the population were impoverished, lacking basic services and suffering a deprivation of basic liberties and arbitrary police harassment in their daily lives. The intelligentsia, the media, the arts and education were subject to repression and censorship, emanating from both the regime and the religious authorities. - The Cold War and the fight against the left: right into the 1980s, the USA and its allies, as well as individual regimes, perceived the main threat to be from the political left. The most prominent example was Afghanistan, with the Mujahidin against the communist regime and its Soviet support being generously aided and funded by the US and its allies, notably Saudi Arabia. In Egypt, Anwar Sadat followed Abdul-Nasir as president in 1970, then moved Egypt into the US sphere and capitalist opening up (infitah), away from Nasir’s socialism and Soviet alliance. He later made his historical move to make peace with Israel (1977). He had to contend with the various forces of the left who resented these transformations. Sadat responded by licensing and encouraging political Muslims to confront the leftists, especially in the universities, the media, labour unions and professional syndicates. While the Muslim Brotherhood remained officially banned from politics, it was de facto given wide scope in all these fields and in publications and the media. Similar moves occurred in Jordan and Algeria. - In Egypt and elsewhere oppositional organised Islamic politics was banned and sometimes persecuted, alongside other organised oppositional politics. However, religious political and social organisation could bypass these obstacles through mosques, charities, social services, and control of civil society organisations, such as professional syndicates. In Egypt the Muslim Brotherhood under Sadat and Mubarak continued to have a public face, with offices, organisations and media, and fielded candidates for parliamentary elections as independents or affiliates to other parties. They were subject to occasional bans and arrests, but generally tolerated. In addition, the regimes encouraged and co-opted conservative religious figures and associations preaching piety and public morality, some associated with al-Azhar (mosque/university, and state institution of religious authority). These had a prominent presence in the media, and engaged in censorship and prosecution and intimidation of intellectuals, artists and cultural productions they accused of heresy or disrespect for religion. In Egypt, some political parties were licensed, but for the most part they were ‘talking shops’ with newspapers, with little scope for organisation of grass-roots constituencies. For instance, any attempt by leftist groups to connect to labour organisations were attacked and persecuted. - The withdrawal of the state from welfare services and provisions opened up opportunities for Islamic associations, some affiliated with the Muslim Brotherhood, to step into service provision to a populace increasingly impoverished by neo-liberal economic policies, and the depredations of crony capitalism. Members and affiliates benefited from the opening up and economic liberalism. There was a constant stream of labour migration to Saudi Arabia and the Gulf, following the oil boom of the 1970s, and their remittances constituted a major source of income for many Egyptians. Capitalists and entrepreneurs, some refugees in Arabia from political persecution in Egypt and elsewhere, prospered from the boom and established businesses and connections. These connections fostered ideological influences and commitments to the Saudi brand of Wahhabi conservative Islam. Enterprises established in Egypt became major employers and benefactors, thus spreading patronage with an Islamic tinge. The Islamic parties were thus well placed to take advantage of the opportunities offered by the collapse of the dictators, an outcome to which they contributed only marginally if at all. They also advanced thanks to electoral politics where this was enhanced, as in Morocco. Their success was aided by the transformations undergone by the movements of political Islam over the previous decades, to which we must now turn. Over the course of the twentieth century there have emerged many different orientations and trajectories of political Islam. Since the nineteenth century, the increasing separation of spheres of society, culture and government from religious institutions and authorities generated diverse reactions, ranging from conservative retrenchment to projects of Islamising modernity. In addition, Islamic politics was always articulated in one form or another to nationalist and anti-imperialist projects, involving cultural struggles against what is seen as western and secular invasion, and thus reinforcing identity politics and the quest for authenticity. This aspect reached its height with the Iranian Revolution of 1979. Anti-imperialism and nationalism in the Arab world, thus far expressed in leftist ideologies, began to shift into a new articulation to different forms of Islamism. The quest for the Islamic state and for Islamic authenticity in culture and society became dominant in the 1980s and after. What constituted the Islamic state and law, and how it was to be achieved were matters of diverse positions and contests. Radical and violent jihadism spread from the Afghan war onwards, with the return of Arab volunteers to their countries: it sparked a bloody war in Algeria, and fed into jihadist movements in other countries. In Egypt it reinforced the already active jihadists who assassinated President Anwar Sadat in 1981. The 1980s and 90s saw many violent attacks and assassinations, including attacks on tourists and on prominent writers and artists, met by intensified violence and indiscriminate repression by the police and the many security forces. The mainstream Muslim Brotherhood kept its distance from the militants, while occasionally expressing sympathy with their sentiments, especially the attacks on cultural figures. 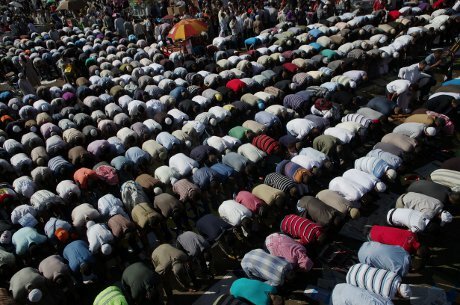 More liberal Muslims sought to cast the nationalist project in religious terms, seeking cultural authenticity. Conservative ulama and their followers continued to advocate the moralisation of society and public space and persecution of what they saw as heresy and disrespect for religion. Family, women and sexuality are central items in all these projects. Sectarian sentiments against Copts and other non-Muslims continue to be common components of activism. The jihadist violence met with overwhelming and indiscriminate repression from state security and military authorities. The Algerian war was ended after much bloodshed, mostly of civilian populations, victims of both Islamist jihadists and state security forces. The Egyptian jihadists ended their violent attacks, their jailed leaders declaring a renunciation of violence. Increasingly, over the 1990s, jihadism was ‘de-territorialised’ from the main nation-states and into the territories of ‘failed states’, notably Afghanistan, then Yemen, Somalia, and now Syria, and into transnational networks, such as the one that perpetuated the 9/11 attacks in the US. Within the main nation-states, notably Egypt, Jordan, Syria and the Maghreb countries, the mainstream, mostly pacific, Islamic parties, such as the Muslim Brotherhood and the Nahda in Tunisia, became the main advocates of Islamic politics. These parties increasingly adopted the rhetoric of democracy, accepting pluralism in politics and religion and participating in media and electoral politics whenever that became possible. They also moderated their demand for an ‘Islamic state’ and the application of the Shari`a, resorting to ambiguous formulations, such as the one current in Egyptian Muslim Brotherhood rhetoric, of ‘a civic state with an Islamic reference’, to which we shall return. This ambiguous liberalism extended to positive notes on the equality of women and non-Muslims, subject to some reservations, referring to indeterminate Islamic provisions. Demotix/Emir Ben Ayed. Muslim Brotherhood and Salafist rally in Tahrir Square. All rights reserved. Alongside these mainstream Muslim parties, there persisted the deep and widespread currents of conservative Islam, commonly designated as ‘Salafi’. These currents declared an aversion to political engagement, emphasising instead the call for strict religious observance, the adherence to moral commands, with particular emphasis on family regulation, gender segregation and sexual proprieties, and the combat against ‘deviant’ religious practices of mysticism and veneration of saints, and especially Shi`ite. These currents were congruent with the Wahhabi advocacy from Saudi Arabia and the Gulf. Their attitude to politics is that the matters of state should be left to the Muslim ruler (e.g. Al-Saud in Saudi Arabia), and that one should engage in campaigning only to ensure the application of religious and moral proprieties. This advocacy has a clear appeal to the rulers, and the Salafis fared well in Egypt and elsewhere, with some of their leaders co-opted into regime institutions and media. In Egypt, the Salafis were not advocates or participants in the uprising that led to the fall of the regime. However, they saw opportunities in the new situation to mobilise their constituencies for electoral gains, with a programme for a far more stringent Islamisation than that of the Muslim Brotherhood. However, there is considerable overlap with some of the more conservative constituencies of the MB. The combination of factors discussed in the foregoing give the Islamic parties considerable advantage in free elections following the dictatorships. The Muslim Brotherhood in Egypt has proven its capacity to mobilise large numbers of supporters, with appropriate transport, for any mass action, including elections. These are networks established over the years, aided by charities, social services, job provision, finance and business opportunities, as well as cultivated pious support. Their only rivals in this respect are the organised bodies of support for the previous regime, the ‘deep state’, depending on networks of patronage from the ruling party bosses, security services and various bureaucracies. The second round of the presidential elections in Egypt in June 2012 saw the face-off between these two forces: Morsi for the MB and Shafiq for the ancien regime, and they were neck and neck. Negative votes, either against Morsi or against Shafiq swelled the support for the other by voters who did not like either. Salafi parties, previously opposed to politics and democracy, jumped on the bandwagon and gained 24% of the votes in the parliamentary elections in 2011. Their success is attributed, at least in part, to the generous hand-outs to poor people, funded by plentiful grants from Saudi and Gulf sponsors, organisations and individuals, not necessarily state agencies. Liberals and socialists, mostly secular, but also some religious, do not have organised constituencies. As we saw, any attempt at organisation was heavily repressed by the security regimes. They are the forces and the cadres who initiated the ‘revolution’, which were initially avoided by the Muslim Brotherhood, who jumped on the bandwagon when the regime seemed to be weakening. The demands for the revolution were for liberty, dignity and social justice, against corruption, for jobs and social care, and for the rule of law. The MB politicians joined in these demands, with an ‘Islamic reference’. Can they or will they deliver? The leaders of the MB and the Nahda have been pragmatic: they declared their democratic credentials in the contests of pluralist politics, but they also have to satisfy their conservative constituencies and deliver on Islamic law and morality, especially with vociferous Salafis at their flanks. There is nothing particularly Islamic about economic policy and government administration: in fact the Islamists in government in Egypt and Tunisia have been floundering on economic issues and policy, continuing with the neo-liberal orientations of their predecessors. The key fields for establishing Islamic credentials are those of family, morality, public space, cultural expression and education. As I write these lines there is an increasingly sharp confrontation in Egypt between the MB President Mursi and his vociferous supporters and a wide range of liberal and secular groups (including Muslims who are not Islamists), supported by significant sectors of organised labour and frustrated poor and unemployed youth who don’t see a remedy for their situation in MB policies. The main issue is the draft constitution, rushed through by a Constituent Assembly dominated by Islamists: liberal and secular members had walked out in protest. The draft constitution appears to grant rights and liberties, but gives a privileged position to Islamic law (as formulated by orthodox Sunni authorities) in legislation, and nominates the high ulama of Al-Azhar (the instituted authority of official Islam in Egypt) as consulting authorities on such interpretations. It also contains ambiguous clauses about ‘respect for religion’, support for the Egyptian family and its moral values, and provisions for prosecution of deviance from these, vaguely stated, norms. Thus, rights granted in one part of the constitution are subverted by catch-all vague provisions of religion and morality, as well as wide powers granted to the executive. This is, presumably, part of the ‘Islamic reference’ of the ‘civic state’. Opponents also reject the powers granted to the Presidency and the executive over parliament, law and the judiciary in the draft constitution, and its silence over the privileges of the military, whose affairs and budgets are not subject to civilian control. This constitution was rushed to a referendum which approved it by a turn-out of 32 per cent of the electorate. Its legitimacy continues to be fiercely challenged. Disillusion with the MB in government so far, and anger at the procedure and content of the constitution, as well as the continued police repression, puts into question the outcome of the planned legislative elections in Egypt. Many view the MB presidency as having commandeered the existing apparatus of security and repression that served the previous regime. Electoral democracy, without sturdy institutions and a system of checks and balances, can become majoritarian authoritarianism. This is not peculiar to Egypt or the Arab world, but can be seen at the present time in Vladimir Putin’s Russia and in Tayip Erdogan’s Turkey: populist leaders with constituencies based on organised networks of patronage and dependence, as well as the image of national power and resurgence against foreign conspiracies, facing an opposing public of citizens, of educated urban middle classes striving for rights and liberties and the rule of law. Egypt under Morsi may be heading in that direction. Note that, in these respects, Islam does not enter the equation. But it does as legitimising ideology for authoritarianism. Demotix/Chandra Prakash. 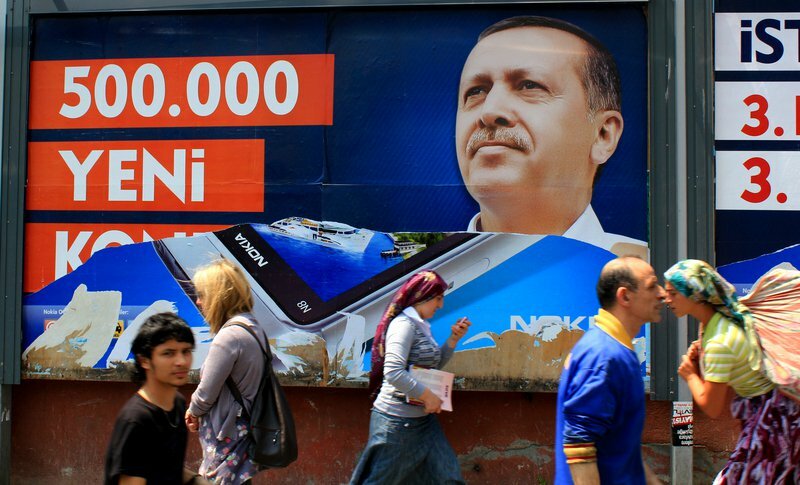 Tayip Erdogan poster in Istanbul. All rights reserved. The Shari’a is largely irrelevant to most important issues of policy and administration in the economy and in government. Its historical and symbolic locus is on family and sexuality: patriarchal rights, segregation of the sexes, enforced female modesty. Civil rights of free expression and cultural creativity are also subject to the religious censor, especially if ulama are given the authority of enunciation over these issues. Education is another ideological objective of Islamism: curricula, text-books, religious instruction and observance, and rejection of ‘alien’ cultures. These educational policies are already pursued in Turkey under AKP (Justice and Development Party) rule, and they have always been part of Islamist advocacy in Egypt and all over the region. In Turkey, creationism is being introduced into the science curricula and the teaching of evolutionary theory censored and persecuted. Demotix/Ahmed Taranh. Demonstrations in Tahrir Square to demand the resignation of President Morsi. All rights reserved. The developments of Arab societies over the course of modernity, from the turn of the twentieth century have provided the conditions for the social presence and activism of civil society citizens of both sexes: trends that can only be put back with intense repression, as we see in the case of the Islamic Republic of Iran. 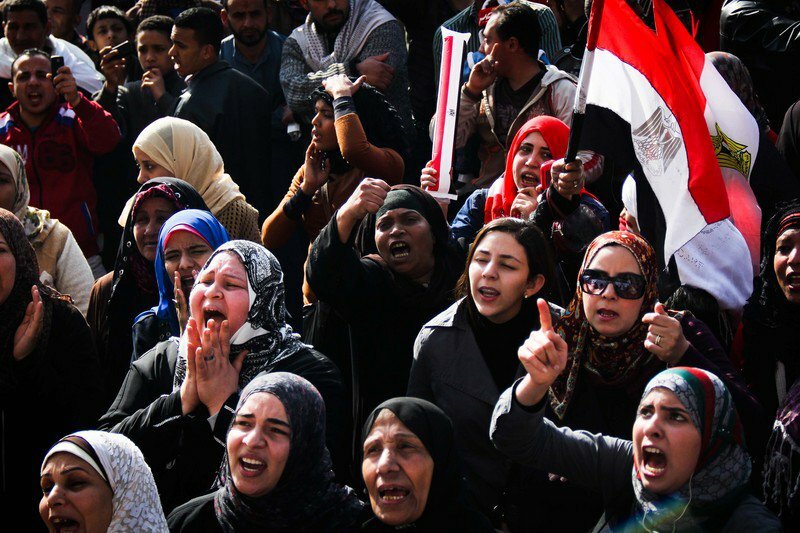 The increasing displays of piety and the veiling of women in Egypt and elsewhere have not held back many of those veiled women from public participation and vociferous advocacy. The political fields and social spaces of many countries in the region have been opened, however chaotically in many cases: there are battles still to come.